Veteran players already know that new game releases are revealed at the ICE Totally Gaming event where online developers showcase graphics and sound of new titles scheduled to release during the year ahead. Microgaming have always played a major part in ensuring this event is full of surprises and this year was not different as the leader in innovation made three announcements that set Roxy Palace players hearts racing. The new Castle Builder II slot is a sequel to the hugely popular Castle Builder created by Rabcat, nominated in 2013 for the Game of the year EGR award. 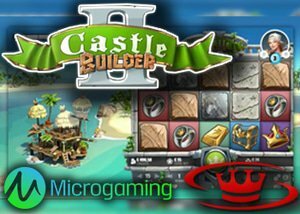 In Castle Builder II video slot the multi-level game offers even more super exciting play and reaches its aim for better and bigger successfully as an entirely new world welcomes thousands of players. New enthralling levels waits to be unlocked, more achievements is available, and 15 kingdoms need to be explored while there are 75 new castles to build and then there are over 300 characters ready to interact with global players. The 75 castles can be built by gathering the finest building materials from one kingdom to another and players get to choose from three different avatars, each having a different storyline. The first Castle Builder video slot went live at over 80 operators globally and the second is bound to be available at all Quickspin and Microgaming casinos. Castle Builder II slot features cup challenges and a comprehensive achievement system in which players earn trophies by focusing on improving their avatar's skills continuously. Inspired by exceptional gaming action based on a spin, build and win formula and compared to average video slots the game is complex, offers players a role as castle builder and their main function is the gathering of building materials needed to complete castles. The collecting is done by combining bricks, wood, metal, or stone on a payline, the collected materials are stored on the left and once six pieces of building material are accumulated they are usable to build part of the castle. A completed castle is like an invite to a prince or princess, and players get to choose a suitor and then pocket the money offered. Players at Roxy Palace can choose between female and male builders, and during gameplay, benefits unlock as more experience points are earned. The journey is to explore the 15 kingdoms, and each kingdom will need several castles to be built, and the game goal is to collect winnings, build castles and to unlock as many achievements as possible. Castle Builder II will launch during the second quarter of 2017, and the new Castle Builder II launch will probably be celebrated by top online casinos, offering Microgaming no deposit bonuses.